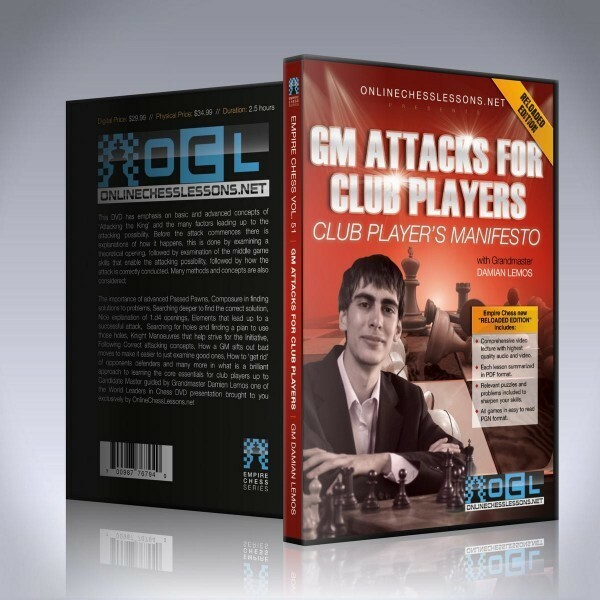 GM Damian LemosGrandmaster Damian Lemos’ excellent presentation skill guides you through this volume which is 1/10 of The Club Player’s Manifesto. This volume has emphasis on basic and advanced concepts of ‘Attacking the King’ and the many factors leading up to the attacking possibility. Before the attack commences there is explanations of how it happens, this is done by examining a theoretical opening, followed by examination of the middlegame skills that enable the attacking possibility, followed by how the attack is correctly conducted. Many methods and concepts are also considered: The importance of advanced Passed Pawns, Composure in finding solutions to problems, Searching deeper to find the correct solution, Nice explanation of 1.d4 openings, Elements that lead up to a successful attack, Searching for holes and finding a plan to use those holes, Knight Manoeuvres that help strive for the Initiative, Following Correct attacking concepts, How a GM sifts out bad moves to make it easier to just examine good ones, How to ‘get rid’ of opponents defenders and many more in what is a brilliant approach to learning the core essentials for club players up to Candidate Master guided by Grandmaster Damian Lemos one of the World Leaders in chess instruction. The importance of advanced Passed Pawns, Composure in finding solutions to problems, Searching deeper to find the correct solution, Nice explanation of 1.d4 openings, Elements that lead up to a successful attack, Searching for holes and finding a plan to use those holes, Knight Manoeuvres that help strive for the Initiative, Following correct attacking concepts, how a GM sifts out bad moves to make it easier to just examine good ones, How to ‘get rid’ of opponents defenders and many more in what is a brilliant approach to learning the core essentials for club players up to Candidate Master guided by Grandmaster Damian Lemos one of the World Leaders in chess instruction. Exclusive Grandmaster/master Video by a brilliant presenter. 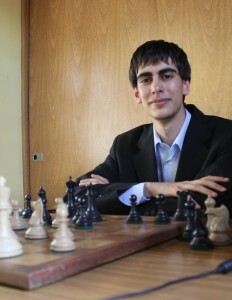 We preselect only the most compelling and interesting Grandmasters and masters.